In mid-January, 1964 ABC Television and The University of Tennessee announced jointly that two shows of it’s Saturday prime time series Hootenanny would be filmed at the university in Knoxville, TN during the week of January 20-24. There was great excitement on the campus and throughout the city of Knoxville. Hootenanny was ABC’s # 2 show, attracting over 11 million viewers for each weekly episode. The two shows were filmed at the agricultural arena on the campus on January 21 and 22. 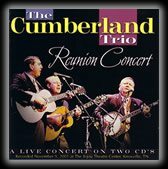 UT executive vice president Dr Edward J Boling arranged for my folk group, The Cumberland Trio, to receive an audition for one of the shows. We auditioned on the morning of January 19 before Fred Weintraub, the Hootenanny talent director and owner of the famed Bitter End folk club in New York city. We performed three songs for him and he subsequently informed us we would perform our signature bluegrass gospel spiritual Ride Up on show # 1 to be filmed January 21. On the morning of January 20 The Cumberland Trio, which had been performing in public for only seven months, reported for rehearsals in the arena. It was a sight for us 19-21 year old college students to behold- cameras, booms and people scurrying everywhere. Seating was available for 8,000 using the floor and permanent arena seats along with bleachers from the university’s football stadium to be placed behind the performance stage. The casts of both shows were all together at the rehearsals that day. The # 1 show consisted of MC Jack Linkletter, host group The Serendipity Singers, Bill Monroe & The Bluegrass Boys, Doc Watson, Pete Fountain & the Mardi Gras Strutters, Homer & Jethro, Joan Toliver, The Goldebriars, The Geezinslaw Brothers & The Cumberland Trio. This would be the national television debuts of folk/bluegrass legends to be Monroe and Watson. The performances were: The Serendipity Singers: “Fast Freight” Doc Watson: “Deep River Blues,” “I’m Sittin’ on Top of the World,” The Geezinslaw Brothers: “Bicycle Wreck,” “Ain’t Gonna Rain No More,” “Cowboy Boots” Bill Monroe: “Mule Skinner,” “Done Laid Around,” “Uncle Pen” The Cumberland Trio: “Ride Up” The Goldebriars: “Saro Jane” Joan Toliver: “The Flowers Are Forever Blooming,” “West Wind” Pete Fountain: “Basin Street,” “Old Gray Bonnet” Homer & Jethro: “Sixteen Tons,” “Jam-bowl-liar,” The show aired on ABC on January 25. The # 2 show consisted of MC Jack Linkletter, host group The Serendipity Singers, Eddy Arnold, The Carter Family, The Simon Sisters, Hoyt Axton, Travelers 3, Vaughn Meader and Sheb Wooley. Arnold was an early inductee into the Country Music Hall of Fame and also an enormous pop star. The Carter Family and June Carter Cash are legendary and members of the CMHOF. Carly Simon later became a huge pop star. The performances were: “Hootenanny Saturday Night” (Everyone) The Travelers 3: “Roll Along,” “Tamora” The Carter Family: “Fair and Tender Ladies” Hoyt Axton: “Grizzly Bear” The Simon Sisters: “Turn, Turn, Turn,” “Wynkin’, Blinkin’ and Nod” Eddy Arnold: “Song of the Cuckoo,” “Poor Howard” The Carter Family: “Worried Man Blues” The Travelers 3: “Land of Odin” Vaughn Meader: Stand-up comedy routine Hoyt Axton: “Thunder and Lighting” Sheb Wooley – “That’s My Pa,” “Building a Railroad” The Serendipity Singers – “Chilly Winds,” “Goin’ Home” FINALE: “Feast Here Tonight” (Everyone). The show aired on ABC on March 7. Also available to any act on either show were the staff lead guitar player Glen Campbell and bassist Bill Lee. Campbell went on to become a big star, hosting Shindig on ABC and later The Glen Campbell Goodtime Hour on CBS. He is a member of the CMHOF and had several # 1 pop hits. Lee was later the father of renowned movie producer and mogul Spike Lee. Jack Linkletter the MC was the son of legendary TV show host Art Linkletter. It was “organized chaos” on the floor and on stage as all acts from both shows rehearsed their performances and camera crews set their angles and mics. Everything was precisely set, down to the second. The director sat suspended above the stage in a “bucket” attached to a small crane. Audio tape was very new at that time and both shows were taped and immediately flown to New York City where they would be transferred to kinescope film and each flown to each ABC affiliate station around the nation the week of it’s broadcast..
Music and entertainment veteran Jethro Burns of the comedy duo Homer & Jethro “adopted” The Cumberland Trio as this was also our first national television appearance and we were confident but naturally a bit nervous. He became a father figure to us during that week and introduced us to all the other performers who were all very cordial and encouraging, particularly June Carter (later Cash) and Eddy Arnold. Burns was one of the great mandolinists of all time and in April 1964 sponsored us to Chet Atkins at RCA Nashville where we would record in famed Studio B which is now located in the CMHOF in Nashville. ABC instructed that no cameras would be permitted at rehearsals or the shows. Unknown to them Joe Kilpatrick, our tenor’s dad, hired a private photographer to sit with him and photograph us during the filming of show #1. Rehearsals went smoothly for us and all the other performers for both shows. We observed how all these big stars handled themselves so effortlessly. So we were pumped and excited to report for filming the next afternoon January 21. The arena was packed to the rafters and it was standing room only. All the performers sat in 2 rows along the stage and each act was introduced by a performer or MC Linkletter. 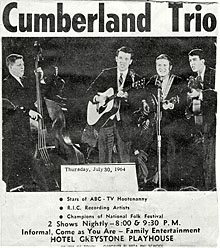 Jethro Burns introduced The Cumberland Trio during the second half of the show. As soon as he made the introduction and the cameras switched to us, the audience which consisted mostly of UT students refused to stop applauding and the ABC crew was forced to stop the tape. It was awkward but thrilling to us as Linkletter announced to the crowd that they needed to allow us to perform our song. The taping began again and this time Burns incorrectly introduced us as “The Cumberland 3.” The audience again burst into sustained applause but the tape continued to roll as we began the intro to Ride Up with Tom Kilpatrick beginning the song at 1 1/4 the normal speed with adrenalin flowing. Our performance was flawless and as we ended the song the home town audience again erupted into sustained applause and a standing ovation. After the filming of show # 1 was completed all the performers from both episodes went backstage for a buffet dinner and the atmosphere was almost as electric as at the performance itself. Many of the acts told us we’d done a wonderful job and wished us luck in our career. Burns told us, “You boys are as good or better than any of those big folk groups. You just stay the course and try to get even better.” I remember those words to this day. Show # 2 was filmed the next day and again the arena was packed. We sat in the audience relaxed and enjoying the performances of all these seasoned acts. To be in their company for those three memorable days was surreal. It was the entertainment experience of our lifetimes and remains embedded in our memories.